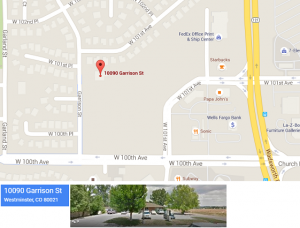 Stretch Colorado is located 10900 North Garrison Street, Suite 101, Westminster, CO 80021. We are open Monday through Friday from 9:00 am until 5:30 pm. You can contact us either by telephone (720) 214-3345, email or via the web form.